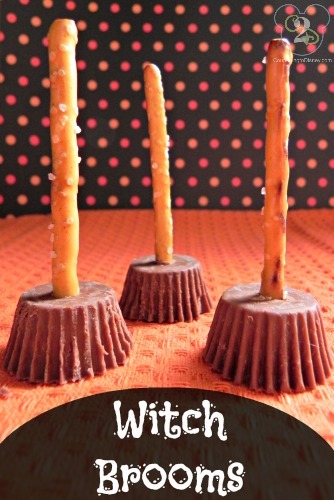 Witch brooms are a fun and easy treat that you can make for Halloween. They look really cute and are the perfect blend of sweet and salty. Simply insert a pretzel stick into a Reese’s cup and that’s it. If you want to jazz them up a little more, you can pipe some black icing around the bottom of the sticks where they go into the chocolate. Or tie little bows around them. Just make them your own and everyone will love them! I am missing the instruction and what kind of pretzel is best. CAn you make these a day or two ahead of time without the pretzel getting soggy? yes, I made thembthe night be my party. I was look inking instruction on how to get stick to stay onto cup. I used a metal skewer to make the hole first , I used small pretzel sticks. and how in the world do you insert the pretzel sticks without breaking the pretzel or shattering the reeses cup?! I lightly twisted the pretzel and that seemed to work. These witch brooms are so cute! What a clever idea! We shared them on our Facebook page (https://www.facebook.com/pages/In-Its-Place-Kids/399351143525190) and pinned them to our Halloween board: http://www.pinterest.com/initsplacekids/we-love-halloween/. In Its Place Kids is the one-stop, internet shop for all things related to organizing kids. We answer the question that all moms eventually ask: “What do I do with all of my kids’ stuff? !” Check us out at: http://www.initsplacekids.com. We’ll help you put your kid clutter in its place!